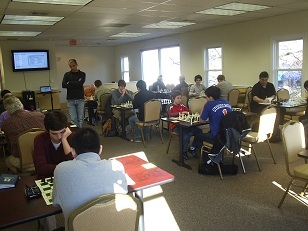 The penultimate event in our CCFC Championship Series lived up to its hype with 23 players representing a wide rating spread from newly minted "Sharks" and CCFC regulars Alan Pinto and Carl Scovens, all the way up to chess legend and International Master, Jay Bonin. The games were heated and intense, and contained many nasty surprises, causing friends to become rivals and feelings to run amok! Long-time friends and co-staff members NM Ian Harris and NM Harry Wheeler crossed swords in the final round in a high-drama battle to the death. One of Ian's final moves placed his knight en prise to no less than four enemy pieces in his blood-thirst for mate! Lowinger-Pressman, in a battle for first on board 2 was equally tense. Leif had prepared deeply against Lowinger's pet Scandinavian system and secured a significant advantage not long after the opening. Then the miracles began: the sky opened, the waters gushed forth, and Lowinger, suffering on the clock and the board, seeking desperately for a draw, managed miraculously to find a path to victory and a perfect 3-0 to tie for first. 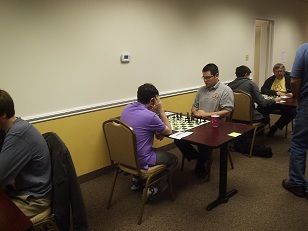 On board 1, top-seed IM Jay Bonin faced CCFC newcomer NM Michael Thaler who played aggressively against Bonin's pet line in a strange Caro-modern-gurgenidze hybrid (beginning with 1...c6, 2...a6!?!?!?). Thaler maintained a space advantage throughout the game and converted in the end for a perfect 3-0 finish and a rating of over 2300. Near experts Ethan Segall, Nicolas Checa and (name) shared U2100, Kevin Zimmerman won clear 1st U1800, and Al Pinto won U1300. Congratulations to all participants. With such an event as an omen, the Club Championship on the 21st promises to be a tournament for the ages. See you there!